Your child’s digital reputation is more important now than ever as it may affect their ability to hold a job, play on a team, and even get into college. Here are a few important talking points to review with your preteen and teen as you discuss the impact their digital reputation can have on the rest of their lives. A “digital reputation” is the image you project and content you create online. It is shaped by what you post and the way you act online. It also includes what others post about you and all of the information that can be found about you through search. It is your “personal brand” online, and may be the only impression someone has about you if they don’t know you personally. In the current landscape of technology and social media, the digital footprint of your online life starts early, and, more importantly, stories, photos and other online information about you, can last forever. It is never too early to start thinking about, and actively managing, your digital reputation, or your child’s, as it will shape how people perceive you, both online and offline, and can directly impact your personal life as well as your professional life. or in the case of children, their school and young social life. Many preteens and teens think only their friends are reading the content they post on social media. They may be surprised to learn that their, teacher, bosses, coaches and their friends parents are watching too. A baseball player at Bloomsburg University learned that the hard way when he posted an offensive tweet about female Little League World Series pitcher Mo’ne Davis. His coaches and the school noticed his tweet and dismissed the college sophomore from his team. Preteens and teens need to think about the wide audience that can see what they post online and remember that audience includes people they don’t know and may need to have a favorable impression of you in the future. In some cases, college admissions professionals are researching applicants online and using what they find online to judge students and decide if they would be a good representation of the college. According to a Kaplan study, 12% of college admission applicants were rejected because of what admissions counselors saw on social media. Imagine your child working hard to get the grades and scores to apply to great colleges only to be denied because of some errant posts or photos on their social media pages. Colleges, businesses, and teams don’t want to form relationships with individuals who have a bad reputation online. A few ways to build a bad reputation include the following behaviors. On the other side, colleges, businesses, and teams do want to form relationships with individuals that can maintain a professional and positive position on social media through the following habits. Be Mindful of Who Is Listening and Searching About You (It’s Everyone): A good rule of thumb is to not post anything that you wouldn’t want to be published on the front page of a newspaper. Use Your Privacy Settings: If you want to share personal photos with close family and friends, be vigilant about setting your privacy settings. But know that anything you post online, even private things, can be shared. Monitor What Others Post About You: Keep an eye on the photos and posts that you are tagged in. You are responsible for monitoring the photos and posts that relate to you. A parent’s job doesn’t end after talking to their kids about their digital reputation. 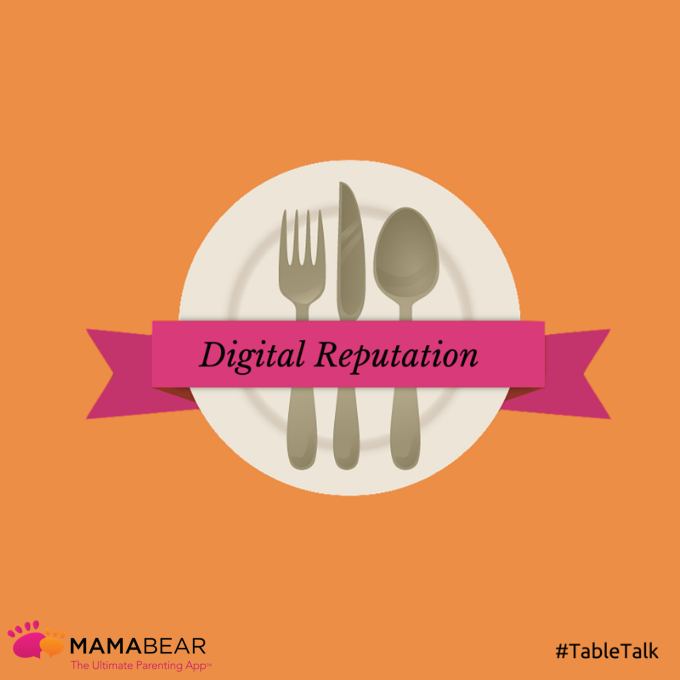 Managing an online reputation is a big job, and kids need continual guidance as they learn the boundaries of social media etiquette and conduct. Parents should remain involved in their children’s social media world by monitoring their accounts and directing their behavior toward appropriate and productive habits that will help them, not hinder them in the future. Parents can easily stay connected using the free iPhone and Android app MamaBear, The Ultimate Parenting App™ which easily syncs a child’s social media stream with their parent’s account and allows parents to see and help manage what is on their social media, even what others post about them.